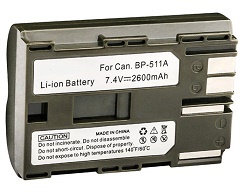 BP-511: (aka BP-512) 7.4 volt 2600mAh Lithium Ion rechargeable battery for Canon Digital Cameras. X-ref part # LIC511. This model replaces the oricinal CANON BP-511, BP-511A, BP-512. 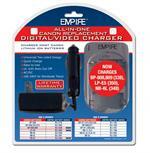 Fits inside Canon Digital SLR camera models, and clips onto the outside of Digital Camcorder models. New upgraded capacity - provides longer running time! Replaces the following battery models: Maxell B-9552, Polaroid B-9552, Canon BP-1267FPLS, Vivanco BP-1267FPLS, Canon BP-508, Canon BP-511, Canon BP-511A, Sakar BP-511CL, Canon BP-512, Canon BP-514, DigiPower BP-CN511, Power Battery BP-CN511, Canon BTI-CN511, Canon BTI-CN512, Sakar CB-511, Maxell DC7222, Maxell DCM7222, Canon DDBP-511, Delkin DDBP-511, Lenmar DLC511, DRC511, DRC511RES, DTI Electronics DTL-511C, Canon ER-C590, Energizer ER-C590, Energizer ERC590, Canon HS-C511, Canon HS-C511Lithium, Canon LI36, Lenmar LIC511, Maxell M7222, IDP PR-118DG, Polaroid PR-118DG, Canon PR-511L, Canon PR-522L, Saft PR511, Canon RV-4461, Rayovac RV-4461, Rayovac RV-5461, Varta V283, Uniross VB101757, GP VCL002, GP VCL005. Also of note: The BP-511 can be charged with the DVU-CAN1 charger package, or with the CHG-BP511.